Estimates place the crowds who are expected to turn out in the nation’s capital for the inauguration of Donald Trump at anywhere between 700,000 and 2 million, in addition to related events and protests. 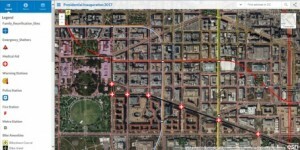 In order to help people stay informed, Esri and the District of Columbia Department of Transportation have created an interactive map using geographic information system (GIS) technology, combined with resources such as aerial high-resolution photos and street-level LIDAR imagery. Users can access the map via any online browser or wireless device such as a smartphone or tablet, where they will be able to see important location information like addresses, street closures, transit stops, medical aid stations, and warming tents. Esri’s GIS platform provides a common base for data in maps like this, which also includes overlays of police and fire station location, Metro stops, bike-sharing spots, for-hire ride-sharing, and taxi locations. A common platform means numerous public agencies can input new data and track conflicting or inconsistent information. For instance, if there are inaccuracies with addresses or the location of certain landmarks, this can be quickly and easily corrected. Esri’s Presidential Inauguration map is a precise, shareable tool connecting the public with useful spatial data from government entities, ensuring situational awareness for everyone during such a large-scale event.